Extreme anger is difficult for parents to deal with. Dealing with extreme anger in a child is often difficult for parents. Violent or angry outbursts from a child can cause unnecessary stress to parents and other family members. If it continues, excessive anger can also interfere with social interactions, emotional development and academic success. It is important for you, as a parent, to develop healthy strategies for dealing with excessive anger and to discourage your child from using anger as a form of expression. Staying calm is an important part of helping your child deal with his or her anger. A child who lives in an environment where conflict, anger or violence is common will often see these as acceptable reactions and imitate them. As noted by R.J Fetch, a human development and family studies specialist, when parents feel calm, they model effective anger and conflict management. Staying calm can also help deescalate a child that exhibits extreme anger. Anger is a form of expression. It is important to understand why your child is angry and to explain why intense reactions to stimuli are not acceptable. Healthy communication patterns can help you teach your child about extreme anger, discuss its impact on others and provide consequences for extreme reactions when they do occur. 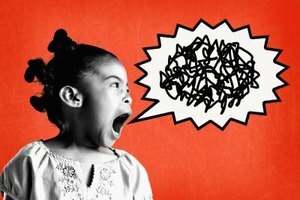 Communicating with your child can also provide insight into any other factors that may be contributing to anger. A child needs to know that there are acceptable outlets for frustration and anger. You can help your child to differentiate between healthy and unhealthy expression of emotions by providing alternatives. According to a 2012 article published on Kidshealth.com, coping strategies for angry outbursts include taking a break from conflict before anger can get out of control, drawing or painting to express emotions, and engaging in physical activity. A child should also learn how to resolve conflict and problem-solve without getting angry. Extreme anger can also result from underlying psychological or behavioral issues. If you think this could be the case with your child, you may want to consider finding a child psychologist or mental health counselor. According to the American Academy of Child and Adolescent Psychiatry, early intervention focuses on teaching children to control anger, appropriate ways to express anger, to take responsibility for their actions and to accept consequences.